Remember last April, when Congress brought forth a bill to redesign the IRS? Well, that bill was shot down, but it’s back for round two. The Tax Payer First Act has 45 provisions to improve the IRS. Some of these provisions include improving taxpayer services and modernizing the IRS on an organizational and technological level. Another “fun” provision would increase the penalty for failing to file a tax return by the due date (not accounting for extensions and reasonable exceptions). Currently, the minimum penalty is about $205, but the bill would increase that to $330. If the bill goes through, this provision would affect tax returns filed after December 31, 2019. How much money would this particular provision raise? About $219 million in a decade. It is all up to the IRS to submit a plan to redesign its structure. If this bill passes, it will be the first structural changes to the IRS in two decades. 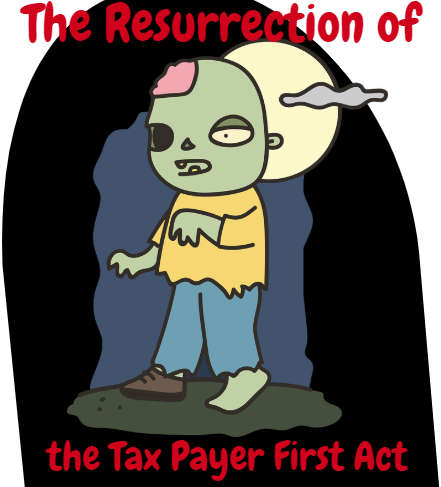 Learn more about the Tax Payer First act from Michael Cohn. The Committee on Ways and Means outlines the whole bill here. Our take on the first attempt of the bill.